Found your link on the sock knitters page. 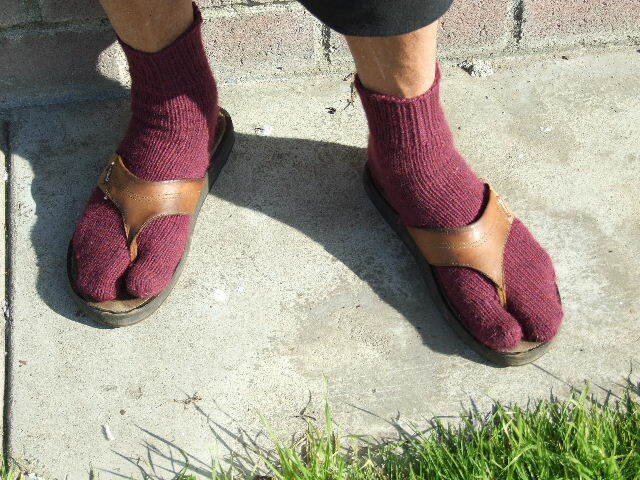 I’ve been looking for tabi toe up patterns for ages. The ones I found didn’t seem to do the space between the toe well. Yours looks great! Not bulky at all. My son lived in Japan for years and loves tabi socks beyond all others. Now I can make him a pair. Thanks! I have a question regarding the tabi sock pattern. I desperately want to learn to make these. Pardon my stupidity, but the way I read it, you pick up your number of stitches from the waste yarn and then that set up row throws me off. Since I’ve already picked up stitches from the waste yarn, what exactly am I doing on the set up row? Am I just purling across the stitches I just picked up? Also, on row 7 you knit across until 3 sts remain on LN but then on row 5 you purl until 5 sts remain. Since this doesn’t follow the flow of the rows 2 – 6, is it really 5 sts or should that be 3 sts? Sorry for all the picky stuff, but you’ve gone to a great amount of trouble to create this pattern. I’ve done the foot measurement thing and am hopeful of knitting tabi socks that really fit. Thanks for sharing all you’ve done. The set up row is exactly that, it secures the beginning foundations stitches of the toe cap of your big toe – purl away. Is this pattern still available!? I can’t seem to find it on this page… I would LOVE to make these!! !